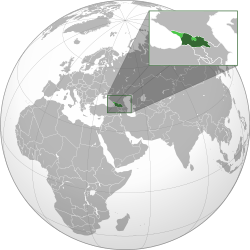 Georgia proper shown in dark green; areas outside of Georgian control but claimed as part of its sovereign territory shown in light green. ජෝර්ජියා යනු යුරේසියාවේ කෝකසස් ප්‍රදේශයෙහි පිහිටි ස්වෛරී රාජ්‍යයකි. බටහිර ආසියාව සහ නැගෙනහිර යුරෝපය අතර සන්ධියක පිහිටි මෙය, බටහිරින් කළු මුහුදෙන්ද, උතුරින් රුසියාවෙන්ද, දකුණෙන් තුර්කියෙන් හා ආර්මේනියාවෙන්ද සහ, ගිණිකොණ දෙසින් අසර්බයිජානයෙන්ද මායිම් වී ඇත. ජෝර්ජියාවෙහි අගනගරය ටිබිලිසි වෙයි. ජෝර්ජියාවට අයත් භූමි ප්‍රමාණය 69,700 කිමී² වන අතර එහි ජනගහණය 4.7 මිලියන පමණ වෙයි. ජෝර්ජියාව ඒකීය, අර්ධ-ජනාධිපතිමය ජනරජයක් වන අතර, රජය තෝරාපත් කර ගනු ලබන්නේ නියෝජිත ප්‍රජාතන්ත්‍රවාදයක් ඔස්සේය. ↑ "Article 8", Constitution of Georgia . In Abkhazia, also Abkhazian. ↑ 2.0 2.1 2.2 2.3 "CIA Factbook Georgia". Cia.gov. සම්ප්‍රවේශය May 2, 2016. ↑ Moved in 2013 from a president-parliamentary system to a premier-presidential system. ↑ "Number of Population as of January 1, 2015 — National Statistics Office of Georgia" (PDF). සම්ප්‍රවේශය 1 May 2015. ↑ "Preliminary Results of 2014 General Population Census of Georgia — National Statistics Office of Georgia" (PDF). සම්ප්‍රවේශය 1 May 2015. ↑ 6.0 6.1 "Georgia". International Monetary Fund. සම්ප්‍රවේශය June 5, 2015. ↑ "Gini Index". World Bank. සම්ප්‍රවේශය June 5, 2015. මේ පිටුව අන්තිමට සැකසුවේ 30 මාර්තු 2018 දින දී, 19:47 වේලාවෙහිදීය.